Letter Tycoon is not like your traditional word game. This winner of the 2015 Mensa Mind Games award is the perfect mix of alphabet fun and cunning strategy and intellectual genius. Each player starts off with 7 letter cards in their hand and 3 community cards are laid out. Use the 7 cards along with the 3 community cards to create the most valuable words to earn money and stocks. Purchase as many letter patents as you can and earn money every time your opponent uses them to build their words. Look out especially for the letter patents with special powers. Have the most patents, stocks and money at the end and become the Letter Tycoon. I am a fan of Word games though there are not many good word games out there. Scrabble was fun but I found that the tactical placement on the grid really turned me off back in the day. The fun of word game lies in crafting those letters into words. But apparently, too many rules or restrictions put me not really like it. You know the feeling, when you found great word from your letters but apparently you short of 1 square of space or even it touches the side of another letter that really screw your word, it’s maddening. Now Letter Tycoon from Breaking Games, designed by Brad Brooks, is something else entirely. It shares the same game principle with Scrabble, but omit the use of the game board. Instead it uses cards for the letters and players need to assemble those cards into a word. 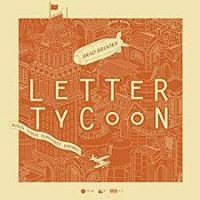 Add a Review for "Letter Tycoon"